More efficient appliances save consumers money. This dishwasher should use about $19 worth of electricity a year, compared to the $58 a year for the appliance it replaces. In the face of threatened rollbacks and inaction on national appliance energy efficiency standards by the Trump administration, the states are stepping up to protect their citizens and climate. Driven by their desire for climate leadership as part of the , states including California, New York, and Washington are hard at work to ensure that their citizens will save energy and money with more efficient appliances and equipment. When states with large populations and markets (like California and New York, which taken together have nearly 20% of the population of the U.S.) set state standards, customers in other states benefit too. For many products, manufacturers will distribute the more efficient product nationwide rather than create a separate product for one or two states. As more states adopt efficiency standards, there’s even more likelihood of positive spillover benefits. The sets minimum efficiency levels for the appliances, equipment, and electronics we use every day. But the federal government isn’t the only player in this space — states have been setting their own standards since the 1970s, and continue to do so today. Over the past decade or so, the federal government has done most of the heavy lifting on efficiency standards, but that it plans to slow progress. While we’re going to keep fighting to protect and preserve national standards and the trillions of dollars in savings for consumers, states can help lead the way by pushing forward standards for additional products. Under federal law, states are generally “preempted”— or prohibited — from establishing state energy-efficiency standards for products that are covered by federal standards, although there are a number of important exceptions to that rule. 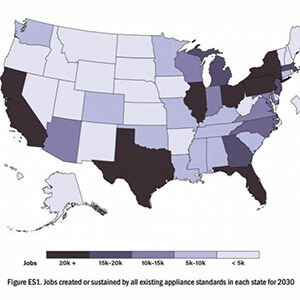 However, states are always free to establish energy efficiency for products that are not covered by the federal appliance standards program, such as computers, computer monitors, and air purifiers; that the Appliance Standards Awareness Project is recommending is shown in the table below. State efficient standards for these 21 products would save consumers nearly $16 billion annually by 2035, according to the Appliance Standards Awareness Project. Products not covered by federal standards still have the potential to save a substantial amount of energy. Water-saving products represent some of the biggest savings: if all states adopted standards for faucets, showerheads, lawn spray sprinklers, and toilets, consumers would save more than $10 billion annually on their utility bills by 2035. Saving water saves energy, too: by using less water, energy savings are achieved by not having to pump and treat the water — or heat as much hot water. Let’s take a look at recent progress happening at the state level. California has long been a leader on state appliance standards, adopting them in 1976 for room air conditioners, central air conditioners, refrigerators, and freezers. Many of the standards that are now federal law started as California standards. The state approved the nation’s first energy efficiency standards for computers and monitors at the end of 2016. And because California is home to one in eight U.S. consumers and manufacturers typically do not maintain separate inventories for different states, the savings are likely to have an impact nationally and even globally. Once in full effect, they will save Californians $370 million a year on their utility bills, and, we believe, lead to de facto national standards and far greater health, environmental and economic benefits. Most recently, California moved forward with improved energy efficiency standards for the everyday screw-based lightbulb. The California standards cover the common light bulbs we use in our homes and require bulbs manufactured on or after January 1, 2018, and offered for sale in the state to achieve a minimum efficiency level of 45 lumens per watt — that’s three times more efficient than the old incandescent. This same standard will take effect at the national level in 2020, but putting the requirement in place sooner means Californians will start saving sooner. With around 250 million sockets in California still containing inefficient bulbs, the savings really add up. Once all of these sockets switch to a more efficient alternative — CFL or LED bulbs — California consumers and businesses will save an estimated $1 billion every year on their electric bills. To learn more, see . There may not be much progress happening in Washington, D.C., on appliance standards, but efforts underway in the state of Washington are promising. 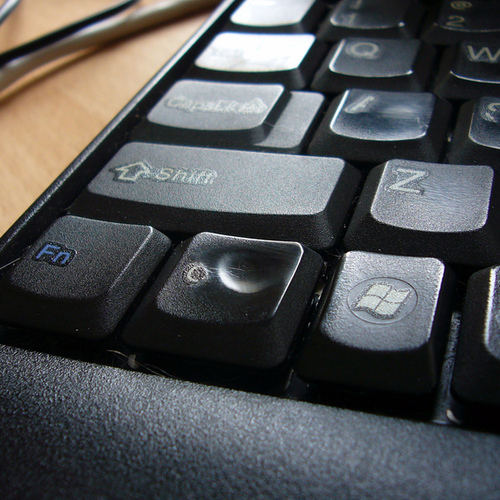 The first hearing for House Bill 2327 to require standards for more than 20 new products including faucets, showerheads, and computers was held in January. This isn’t the first time Washington has tackled efficiency standards — the state already has them for products including pool pumps and water dispensers, which are already saving money and energy. Efficiency standards bills have been introduced in recent legislative sessions, but none have been as wide-reaching as the new bill. If it becomes law, residents will save big — more than $200 million on their utility bills by 2025. The savings grow to $365 million in 2035, while reducing carbon pollution by 400,000 metric tons annually, equivalent to eliminating the emissions from 85,000 cars. To be clear: those are the benefits Washington households and businesses will receive each year thanks to the proposed state standards — real savings that can be spent and invested in other parts of the economy. 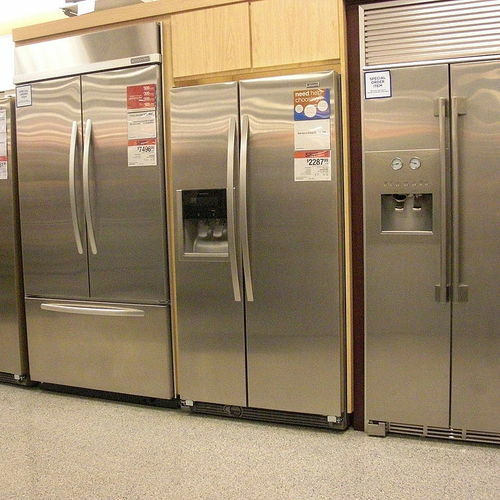 New York adopted state appliance standards for products in the 1980s, but the majority have since been preempted by federal action. Given the lack of current federal leadership, New York is getting back into the appliance standards game in a big way. Governor Cuomo touted state appliance standards in his recent State of the State address, highlighting them as a proven way to achieve significant energy savings, as part of New York’s overall strategy to establish a strong overall energy efficiency target by Earth Day. We expect to see legislation for a number of products offering significant savings for New Yorkers, as well as focus on appliance standards by the U.S. Climate Alliance to advance standards across the Alliance and around the country. 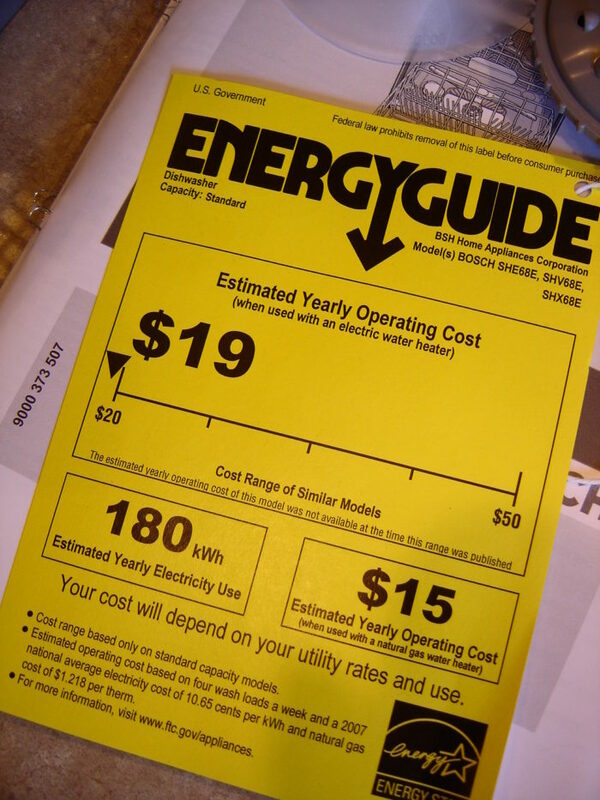 In May 2017, the Vermont Legislature enacted, and Vermont Governor Phil Scott signed into law, legislation that adopts current federal energy efficiency standards for appliances and equipment, “so that the same standards will be in place in Vermont should the federal standards be repealed or voided.” This is an important precedent that other states should follow. And there’s more. Several additional states have efficiency standards bills under consideration, and others will be introducing them in the near future. While states are limited in what they can do because of preemption, this level of state interest and action underscores the importance and impact of efficiency standards. States know that standards are good for their residents, businesses, and manufacturers — and for cutting power-plant emissions. The federal government should follow their lead. Lauren Urbanek is senior energy policy advocate, energy and transportation program, at the Natural Resources Defense Council was originally posted. У нашей компании популярный портал , он описывает в статьях про фото римских штор.